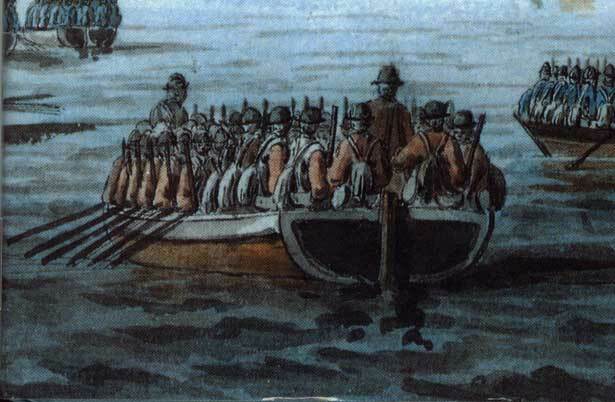 Not the Compagnies franches de la Marine but another unit entirely which didn't go to the Americas. Of course one of the problems I have had in the past is sticking to one thing. 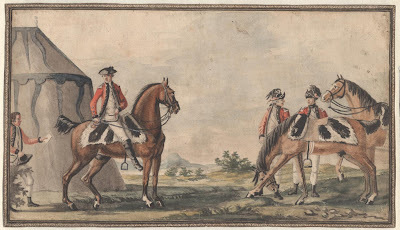 For the Revwar I have 'done' British allied native (I'm on the right at Firle Place home of the Gage family), American patriot artillery, and the 23rd Foot. For the F&I I have done many things but redcoat I haven't done, apart from once at a Jacobite rebellion do. 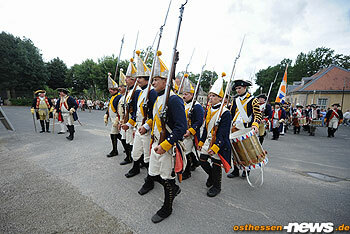 We are a historical reenactment group. We reenact the light infantry company of the 2nd New Hampshire throughout the American Revolution. Our main portrayal is 1781 Yorktown Campaign, but our impressions span throughout the war. We practice several differnt drills of the war. 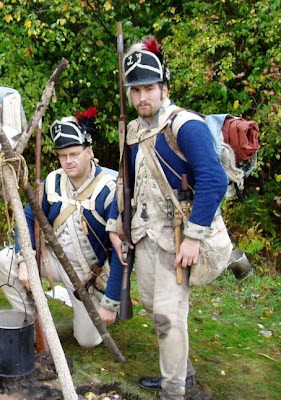 Noticed these sutlers on the Model Company website. They do some interesting products including kits for things like coatees, gaiter/mosquito trousers and these brilliant French grenadier caps. Another Ralph Mitchard original from the old days. I quite like this one. 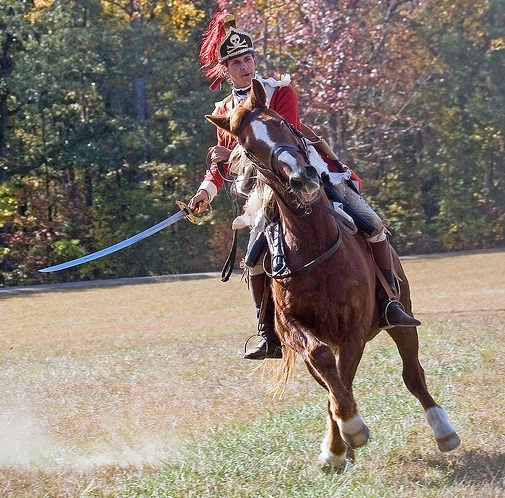 Some great photos here of reenactments in the USA. I haven't looked for long but these rules 'One if by land' look pretty good. And they're free. I like the 1:10 figure ratio. You might as well print them out to have a look but they seem pretty well researched. There are quite a number of sets available for this period particularly since Italeri brought out some useful additions like Iroquois and French although it has to be said they are better on paper than in the flesh having some pretty crazy sculpts (see pic from PSR). Worth checking out if you like plastics though. See listing for the period here. Taking part in the battle of Long Island was this famous cavalry unit - here's the webpage for the spectacular reenactment group in the USA. 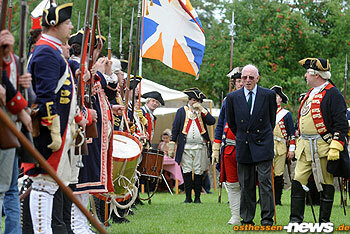 Lots to interest history fans on their webpage. This old photo I like. It's from the 33rd Foot's old webpage. Captures something I think. By Thomas Davies shows the type of boat used at the Battle of Long Island. 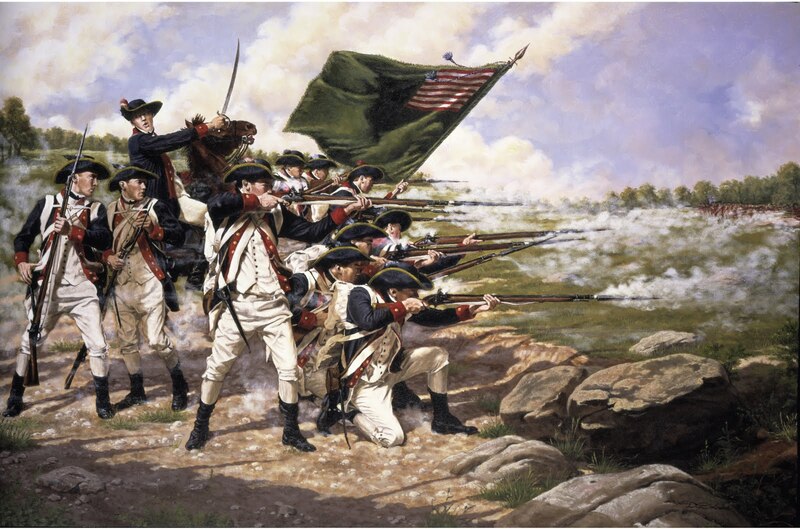 This battle was fought today in 1776. 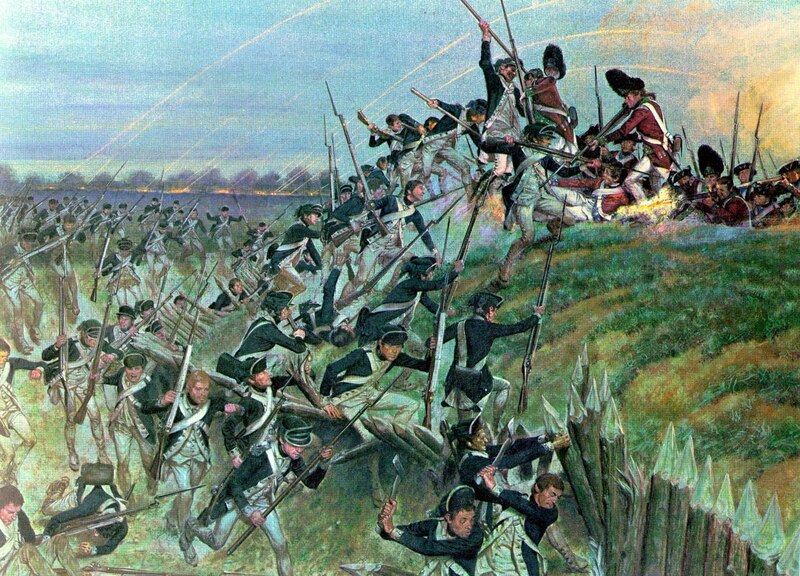 This image features the Delaware Regiment. 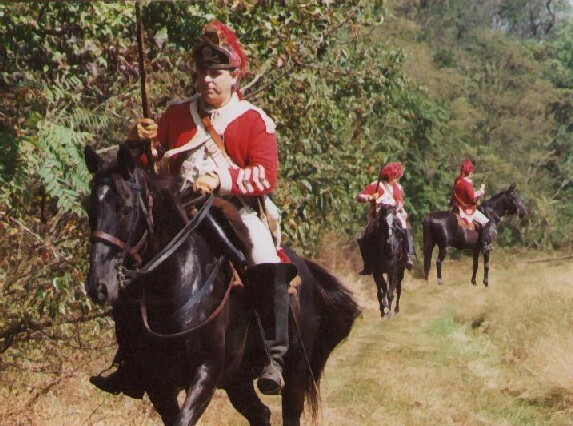 I think the battle scene in the underrated movie Revolution (1985) is of Long Island. Reenacting the German speaking regiment in the BAR/NWTA here. 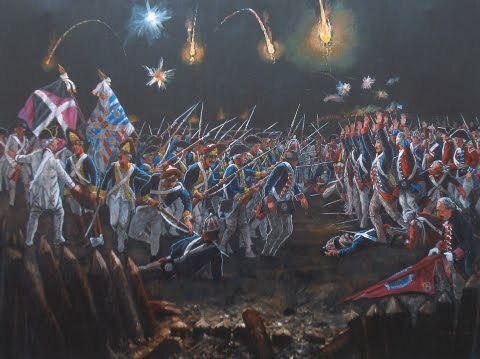 Above image is of the storming of Redoubt no 9 when German blue coats (Deuxponts) fought Hessians causing much confusion in the dark. 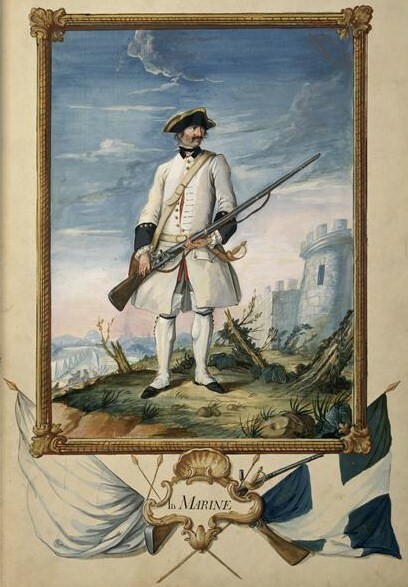 Jean Baptiste Antoine de Verger. 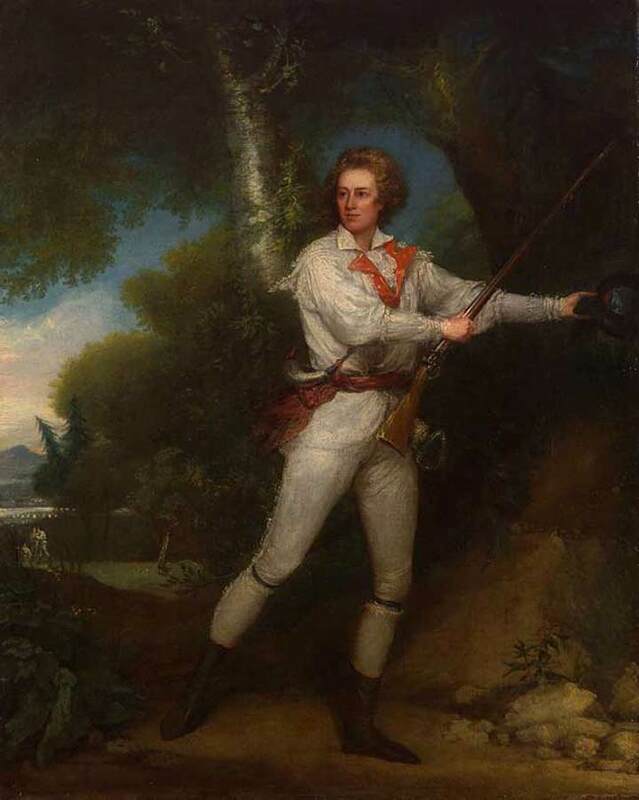 (1762-1851). This soldier, depicted here in a self-portrait was in the Royal Deux-Ponts regiment - a German unit in the French service. 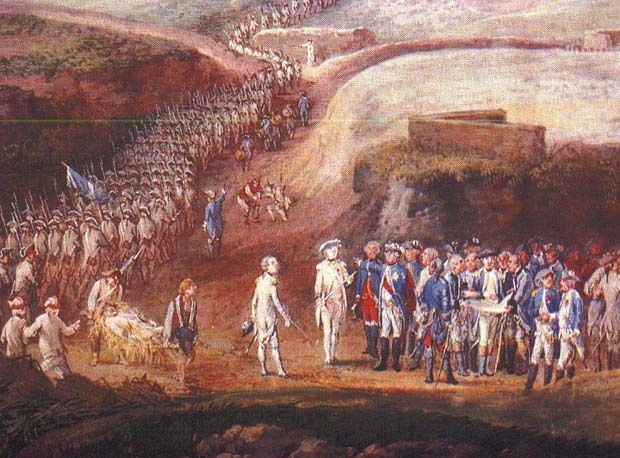 He left a diary as well as a drawing (see below). 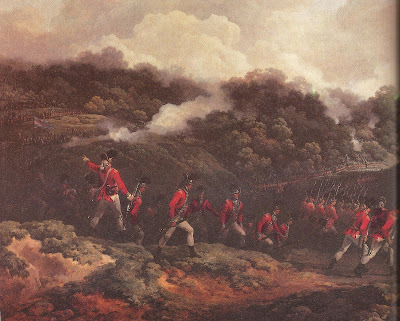 Read his account of the storming of Redoubt No 9 here. 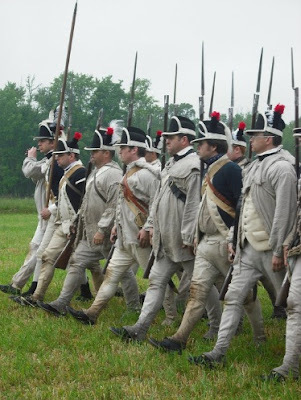 I haven't written much about the French forces in the American Revolution - not sure why not but here's a link to the recreated Regiment Saintonge in the US. If you want various files to do with drill etc then the Gatinois website is worth a look. 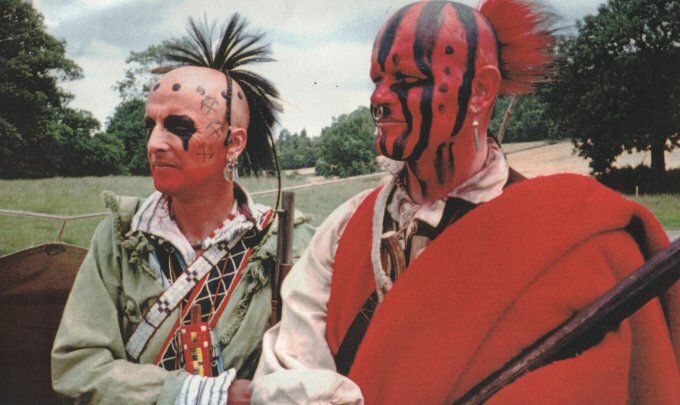 On 6-8 August 2010 over 150 French and Indian War re-enactors descended on Fort Loudoun State Historic Area in Vonore, TN to commemorate the 250th Anniversary of the Cherokee victory there. Cherokee Victory Commemoration at Fort Loudoun from Buck Kahler on Vimeo. Not sure what film this is from - looks good though. 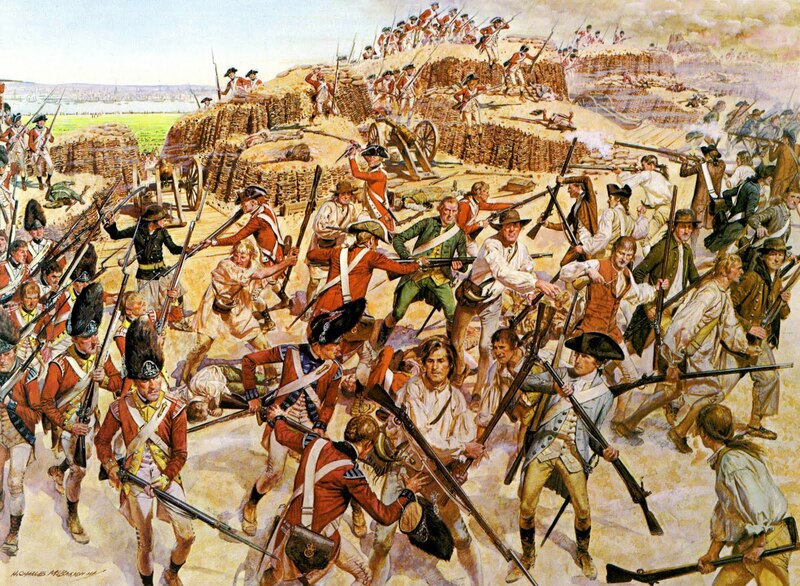 American foot-soldiers during the Yorktown campaign, 1781. 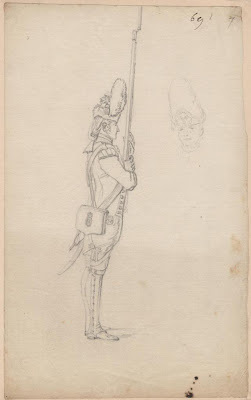 From a water-color drawing in the diary of Jean Baptiste Antoine de Verger. 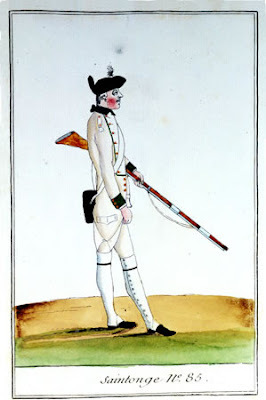 Interesting blog piece here - seems like the pullover type can't be substantiated for the Revwar. 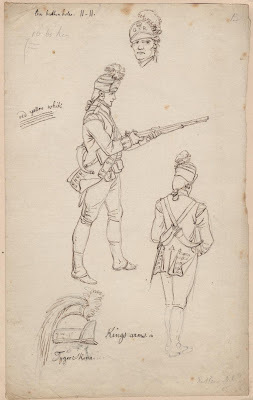 I have been interested for a few posts on the Light Infantry Corps in Washington's army and looking for stuff on them and of course came across this heroic chestnut from I think H Charles McBarron. It's a fine image. Hunting shirts are an item of clothing bathed in much controversy. Here's an interesting and useful piece on the shirt worn by the later period continental soldiers in the south. 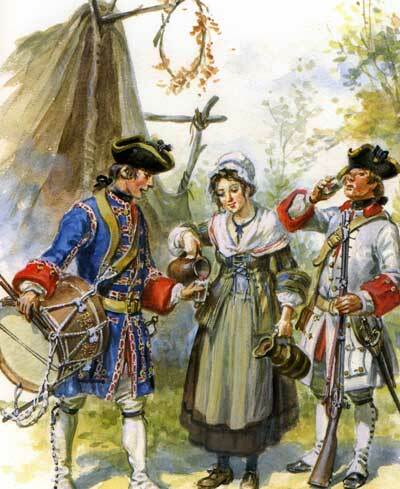 Also see my previous post on the Americaner soldat. 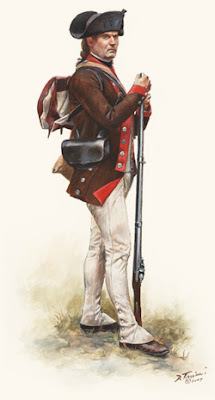 There aren't that many illustrators working in the Revwar period - when you compare it to Civil War it's a handful but one I appreciate is Don Troiani - he seems to sell the period well and his stuff looks to me accurate. Anybody know of any artists out there I might have missed? This is a really interesting project for the Revwar period. They certainly look like a convincing portrayal. Recruiting from across the eastern seabord of the US and meeting a couple of times a year they say on their Facebook page: The Model Company exists to develop the skills and historical knowledge of living historians. 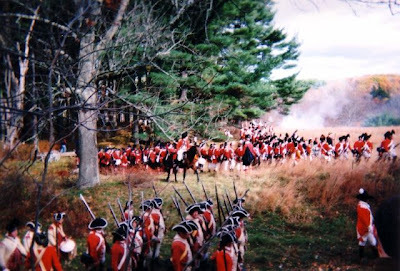 The goal is to get a modern group of disparate, but like minded reenactors to truly act like a company of infantry from the Revolutionary War. Always good to see her photos. News reportage and photos in this German language news item. 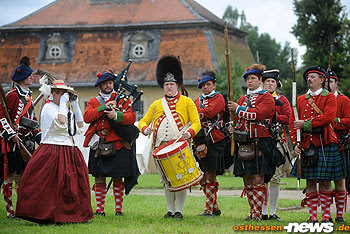 This weekend is the annual SYW/Revwar event held at the Schloss Fasanerie, in Fulda in Germany. These photos are from this German language news article. There's loads of photos at this site so don't worry if you don't speak German. 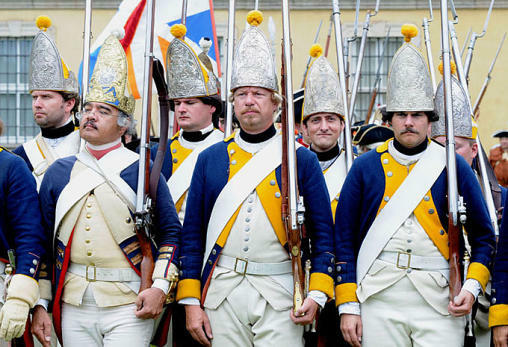 This is the UK's newest 18thc group providing the Revwar redcoats some needed opposition. Check out their Facebook page. 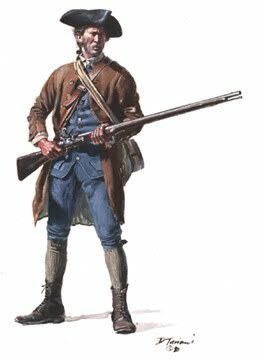 To find out more about what Minutemen were here's the wiki. A new Bushy Run playset (including new Rangers and Black Watch grenadiers) is on the website. Also a fine looking Fort William Henry model is there to tempt your pocket. 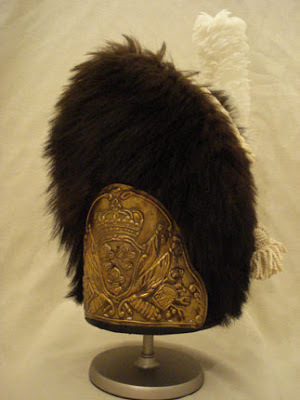 There are some fine native items on this website for our period. Check yourself. Robinson Samuel Black of the HMIC of foot found this series on Youtube. This episode deals with Trenton. Worth watching the opening credit sequence if you don't have time to watch the whole thing. 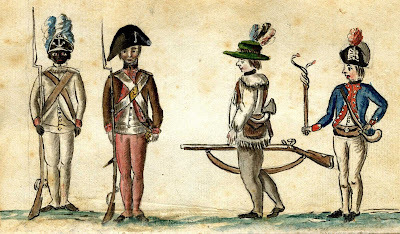 These Spanish made figures for the French and Indian war are out and there are pictures of some of them on the Awaiting Review section of Plastic Soldier Review. This 'whaleboat' looks a nice model. Wiki on the French fort here. 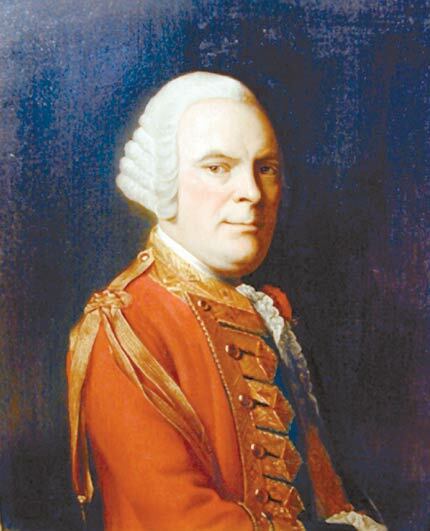 The man responsible for the disaster at Carillon/Ticonderoga.Painted by Allan Ramsay. Go here to see more of this Scottish artists work. Illustrated article in French here at La Compagnie des cent associes site. Look for Expo Temporaire and it will be there. They seem to be an organisation recreating Nouvelle France in France so an interesting site for French speakers. 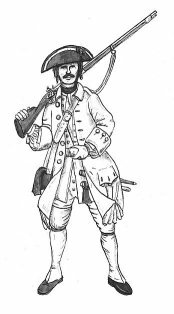 Wargamers and figure painters will find these images useful even if like me the French is a little hard. For all the French speaking readers of this blog here's a video celebrating the battle we Anglophones call Ticonderoga. At the risk of trivialising the subject I noticed someone has uploaded all the episodes of Disney's Swamp Fox starring Leslie Nielsen as Francis Marion. This series which is from 1959 offended the Canadians on a governmental level. 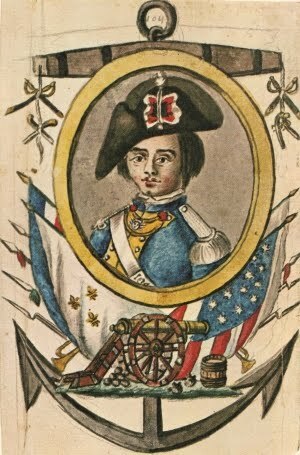 Swamp Fox wiki. Of course this series was the basis of the movie the Patriot. This is something that will hopefully please all of you whether you like the Seven Years War or the Revwar - someone has uploaded the epic miniseries George Washington onto Youtube - this part, part 3 deals initially with Fort Necessity - the Braddock disaster is covered later at the beginning of Part 4. I remember loving this when it came out - still looks OK if a little cheesey but that's the nature of miniseries from the time. I like James Mason's Braddock...quite charming. This 2000 movie starring Jeff Daniels and set in the Revwar about the crossing of the Delaware is up in parts on Youtube.Looks like its worth watching especially as its for free. Has a similar feel to those Gettysburg series of movies. If you want to cut to the chase and get to the Battle of Trenton go here. 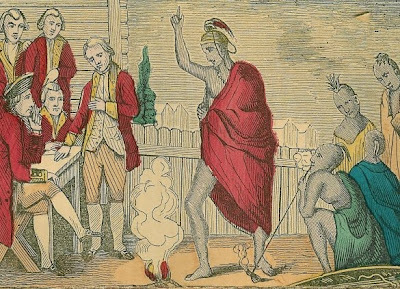 American loyalists are being murdered by Red Indians. An Indian (left) seizes by the hair a loyalist lying on the ground, and holds up a knife saying "I'll scalp him". Another Indian (right) raises a tomahawk in both hands above a loyalist who kneels on one knee, saying "O cruel Fate! is this the Return for our Loyalty". 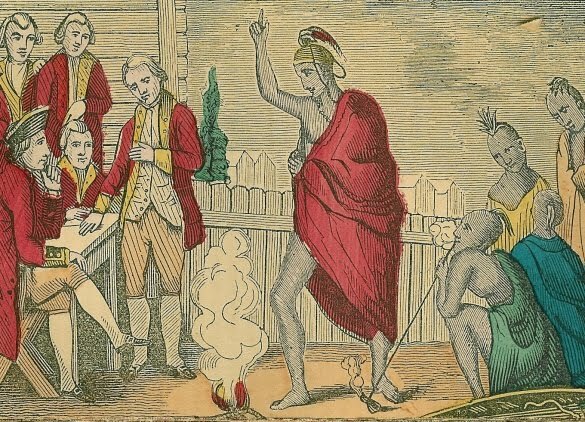 The Indian says, "I'll tomahawk the Dog". A third Indian (left) pulls a rope attached to the ropes by which four loyalists hang by the neck to the branch of a tree, inscribed "Recommended to Congress by lord S------e" [Shelburne]. He is saying "I have them all in a String." 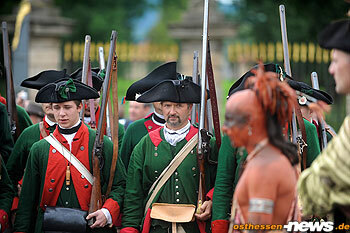 The Indians all wear tall feather head-dresses and kilts of feathers. 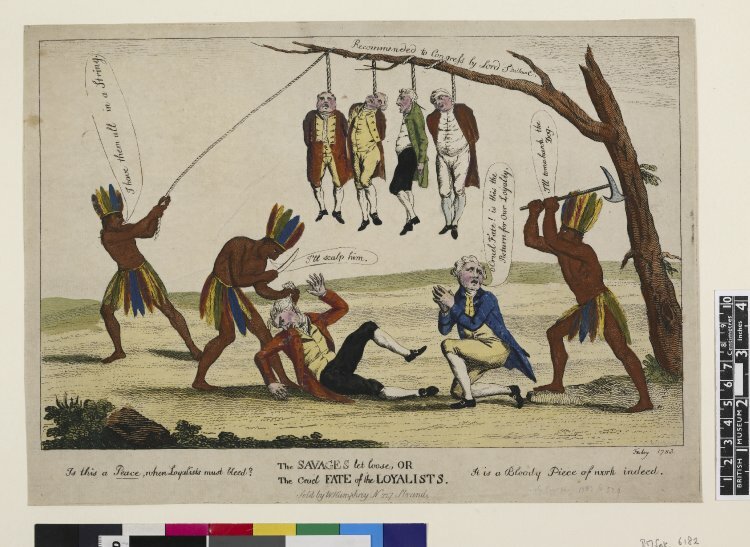 Of the six loyalists, two of those hanging from the tree are dressed as military officers, the others as civilians. "Is this a Peace, when Loyalists must bleed? Go here to see the reconstructed B.I.D. uniform for 1768. 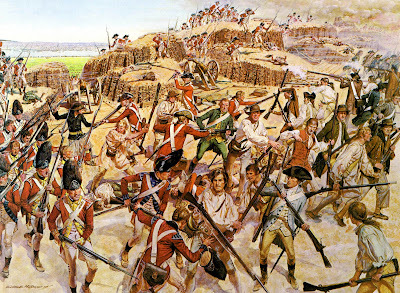 Today we celebrate the victory in 1759 so a few posts on the theme of the long-suffering Redcoat. Here's a pic from my time in the 23rd RWF (I'm on the left) when we took part in the bicentennial of the 1798 rebellion in Northern Ireland. 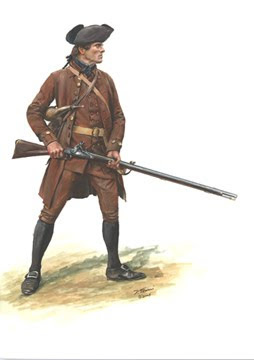 It was pretty hairy at times as people in the North are not used to having redcoats marching around their town as we did at Lisburne and we had people trying to grab our weapons. Although we have had this image before I thought I'd repost it. It is me as a private of the 23rd RWF light company, taken around 1999 by Rosemary Jones. 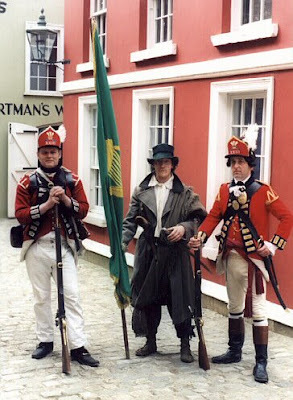 I am probably too heavy to pass as light infantry now but this was a great time and I have wonderful memories of being in this top quality unit. 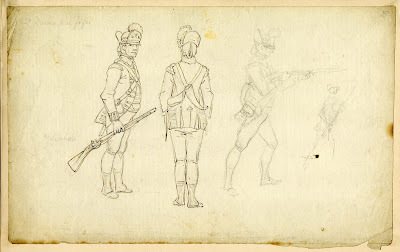 Der Alte Fritz blog has some amazing new sculpts up by Richard Ansell of British troops suitable for the Philadelphia campaign. Worth checking out if you like well sculpted miniatures. 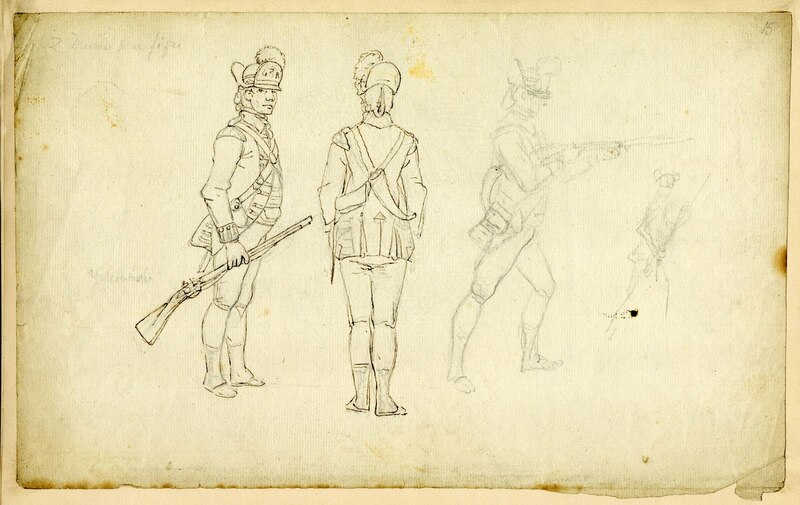 Studies by Phillippe Jacques de Loutherbourg (1740-1812). 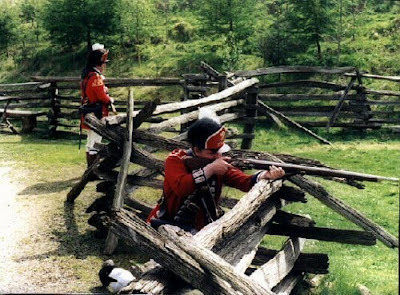 While looking for images of Warley Camp I came across an excellent blog called 'A Mock Attack' dedicated to primary research for the American Revolution - well worth a look.